Andrew Overby Has Peculiar Plea to Make in the Mayor’s Court This Morning. “Andrew were you drunk?” said Mayor Bennett this morning on discerning the familiar face of Andrew Overby, an old timer, among the prisoners brought before him at the opening of police court. “Well! No! I wasn’t drunk, but I was pretty light headed,” came the answer. The question was not argued further, but the mayor feeling that light headedness and intoxication were so nearly allied with Andrew fined him a dollar and costs. Bill Jones, another old timer, who has been on one continuous spree for the past week, was sentenced to ten days labor on the streets. The same old Bill Jones paid a visit to the city jail last night and remained over in order to interview the mayor this morning. Needless to say he was charged with being drunk, but his Honor was inclined to show leniency and he was discharged. With Jones appeared one Walter Scott, charged likewise with imbibing too freely of the bowling bowl. “Are you related in any way to Sir Walter Scott?” asked the mayor. “I don’t know, your Honor, I may be as I have a lot of relatives I have never seen,” the fellow replied. The mayor being in doubt and not wishing to insult the memory of the chivarous (sic) bard told him to take fifteen minutes and get out of town. He went. Bill Jones holds the championship belt in police circles in this city. He is arrested more than any other person. He cannot come to town but what he gets intoxicated and thrown into jail. There are a number of characters about the city who are arrested quite frequently but none of them come up with the same old Bill. The police have been requested to look out for a man who goes by the names of Wm. McCann and Ed Day. The fellow is wanted in Monmouth, Illinois for robbery. Everything quiet in police court this morning. one lone drunk was all the material to hold court with and the Mayor evidently didn’t think it worth while. The lone drunk is the same old Bill Jones. Despite his promises to shake the dust of Fort Dodge off his feet and give the community a much needed rest he gets full of bad booze and as a consequence has taken up a (t)emporary residence in the City Hotel, presided over by the Mayor. Eric Waldberg is taking the place of A.L. Nicholson who resigned last month. The force is short of men at present and no doubt a good man could get on the force at once. All was quiet on the streets Saturday night and the police had little trouble in keeping the best of order. But one man was arrested and he was an old timer who was harmlessly drunk. The crowd was one of the largest of the season too. Just a year ago this month Fort Dodge was having its epidemic of petty thievery and numerous robberies which broke out a (sic) suddenly and lasted the entire month. It is a period long to be remembered in police circles. But the majority of offenders were caught or chased out of town and finally the best or order restored. The local police wre the means of fattening the criminal docket of the Grand Jury for quite a few terms until the local desperadoes were finally all wiped out. Stranger By The Name of James Wilson Was Caught in the Act. After Making Failure of Attempt to Enter Blanden Residence in Daylight he Sneaked into Benj. Jones’ Home – Held to Grand Jury. Nerve beyond record had James Wilson who was arrested Sunday evening for entering two Fort Dodge homes in broad day light at 6:30 in the evening. after failing in his efforts to enter the Blanden home from the basement, he walked over to Benjamin Jones’ residence on First avenue north, and while Mr. Jones was sitting on the front porch entered the house through the back way. He went up stairs and began rifling the rooms of several small articles. Descending he was heard by Mr. Jones, who rushed into the house and grabbed the thief. With a clever himself of his coat and flew out of the house leaving Mr. Jones with nothing but an old ragged coat. Running up the alley he began to attract the attention of all passers-by, Chief Welch happened along and immediately gave chase. The pursued, though fleet of foot, soon became rattled in the maze of streets and back yards and was captured near the home of Doctor Ristine. After his arrest Wilson was questioned by the police and his conduct and answers seem to point to his being somewhat off, though some think that this is put on. He is about five feet eight inches in height and wears a very dark beard. He occasionally puts a look on his face which reminds one of an insane asylum. When captured he put up a fight and uttered a volley of oaths at the officer who caught him, so that he had to be handled roughly. He will give no explanation as to his conduct, claiming that he remembers nothing. Coming out of the cellar window of the Blanden residence, Wilson was seen by Ed Cullen who notified the police at once. After his arrest an investigation of the home was made. It was found that had had entered it through the cellar window in the hopes of reaching the main part of the house through the basement. The doors connecting the two floors being locked, his trouble was in vain. Under ordinary procedure Wilson would have been taken before a justice for a preliminary hearing, but he waived this opportunity and will appear before the grand jury the last of this month. Derailed train car from unidentified wreck. Imprisoned For an Hour Beneath Wreckage Finally Rescued. Accident Occurred Eleven O’clock Saturday Night About Three Miles West of City – Investigation is Being held. As a result of the parting of a train on the steep Tara Hill, Elmer J. Hedman of this city lies dangerously injured at his home on the West Side while the Illinois Central is the loser by several cars, besides delay to traffic. The accident occurred shortly after ten o’clock Saturday night, tow and three quarters miles west of Fort Dodge, on the reverse curve and at the foot of its steepest portion. A train composed of sixteen loaded cars and two empties was sent west from Fort Dodge about 10:30 p.m. in charge of night Yardmaster Oscar Rhodes. Engine No. 107 a local yard engine was pulling the train and was in charge of Engineer Bowen and Fireman Hartnett. Engine 170 another yard engine in charge of Engineer Mater was pushing the train. Yardmaster Rhodes had as his assistants, three members of two yard crews, Foreman Maxwell, and Helpers Hedman and Ashman. Elmer J. Hedman was ordered to go ahead, and ride on the forward engine, while the remainder of the men stayed in the caboose. The train was made up of cars that were destined for western points, and on account of the congested condition of the local yard, were to be taken out and stored in the Tara yards. A littel (sic) west of the Des Monies (sic) river bridge, the train broke in two parts. the men on the forward section noticed that the engine handled the train unusually easy. Hedman immediately went out on top of the cars, and discovered the break. He signaled for the train to stop and after waiting a short time the train proceeded back under caution. Hedman rode on the forward car which was filled with rosin. At a point two and three quarters miles west of Fort Dodge, Hedman noticed the other section coming up the hill, but apparently those men had not discovered the break, for the train was running along a good speed, and without any man on the head car. Herman (sic) quickly hurled his lantern in the air, which is the emergency stop signal, and then dropped flat on the car. Fireman Hartnett saw the signal and the engines were quickly stopped, but not before the crash came. Hedman says that he knew nothing after he dropped on the car, but he was evidently hurled into the air, and fell on his head in the cinders along the track. The car of rosin being the lightest loaded was the first to break and Hedman was covered with the wreckage, while the rosin covered his body completely. The crews of the two engines hurried to Hedman’s rescue, but for a half hour not a sign of him could be found. Then the first engine was sent ahead to Tara to give the alarm to prevent the night passenger from crashing into the wreck. After telegraphing the alarm, the engine again came back to the wreck, but the men had meanwhile found the injured man, or rather he had found them, for he crawled out unaided from the wreck. The men say that the rosin dust blinded and stifled them, while the darkness made their work slower. Just as the other engine was coming back from Tara the men heard Hedman’s voice, as he was apparently talking to himself. Even then they could not find him, but he managed to drag himself although badly injured from the wrecked cars. The cars were piled high above the track, and four of them were locked into a space not much longer than an ordinary car length. Hedman was tenderly carried into the caboose, and one engine started back for Fort Dodge. The injured man was taken to his home in the ambulance, and the company physician with assistants was called. It was found that his left hip was dislocated, and the several deep cuts and bruises were on his head. One cut over an inch in diameter was found in the skull over the left eye. This cut was into the bone, and another one much longer and deeper was in his cheek under the eye. This cut was also down to the bone. Another gash was found in his mouth, while still another was found behind his ear. Every wound was filed (sic) with cinders and rosin. The danger from these foreign substances in the wounds in (sic) great. The cuts will leave deep scars and disfigure him. both eyes are injured, the left being closed completely, while the right can just be opened. It is not thought that the sigh of either eye will be impaired. It was at first feared that internal injures might develop, but as his pulse and temperature are yet good, it is hoped that he had not suffered any. his injures are serious, yet not necessary (sic) fatal. Hedman until a few months ago was chief clerk in the freight office, but resigned this position to take the work of switchman in order to have an out door life. During this time, the man has been injured twice. Hedman is a young man and one of the best known railroad men on this line. He is well liked by everyone, and the news of his injury has caused much sorrow. He was captain of the railroad baseball team, and was an indoor player of ability, and so is known to many outside of the railroads. 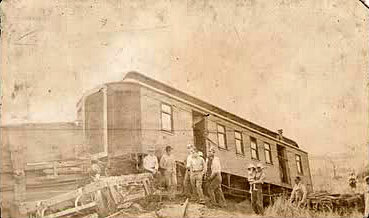 As soon as Hedman had been taken to his home, the switch engine with a wrecking crew was sent back to the accident. The crew worked all night, and at last shoved the cars from the rails. At 5:20 the line was clear again, and the midnight trains on the M. &St. L., and the Central were let by also the morning trains. Soon after the wrecker was again sent out and the work lasted all Sunday. The wrecking outfit is still working at a late hour this afternoon, cleaning up the debris. Four cars were totally destroyed, while others were more or less damaged. The wreckers state that even with daylight no one could tell whether there were one or two cars ruined, as all were so tightlly wedged together. The men counted the car wheels, and thus were able to tell. The car on which Hedman was standing was filled with rosin, the car back of it was filled with pig iron, while the two other destroyed were filled with coal and lumber. The car of rosin being the lightest was destroyed in a twinkling, and the others lasted a little longer. The ease with which these cars broke in parts acted as a buffer, thus saving the others to a certain extent. He said the financial loss would probably be $1,200 or $1,500, that complete investigation had not been held and that until it was he would not be in a position to make any assertions concerning the cause of the wreck, or who was to blame. When asked concerning the rules governing a case when a train breaks in two, he answered by showing the rule book. The rule says that the rear section shall be stopped and then remain stationary, but that the forward section shall run back, to the rear section, but shall be preceded by a flagman. This rule, however, does not seem to govern the case, in that the men on the rear section did not know of the parting. when asked concerning this Mr. Jones replied that the rule should be followed. A very thor0ugh investigation will be held, and the responsibility places. Further than this Mr. Jones said he could not say. He said that when the investigation was completed, the road might be willing to announce further particulars, but not as yet. More than 1,000 pints of beer, brewed in an old ice box in the Farmers’ Exchange, 509 First avenue south, were confiscated last night and Albert Kruse and J.L. Dunivan, proprietors, arrested to face charges of alleged illegal manufacture and sale of intoxicating liquors, brought by both state and federal authorities. Kruse and Dunivan today were each released on $500 cash bonds by county authorities and Police Judge H.W. Stowe; rearrested by C.C. Metz, one of three federal prohibition enforcement commissioners in Fort Dodge, and released on an additional $500 bond apiece by United States Commissioner James Martin. It is expected that both the state, through County Attorney V.E. Gabrielson, and United States authorities will prosecute the case. Sheriff George S. Bassett and Deputy W.H. McDaniel secured several sample bottles of the brew shortly before 6 p.m. yesterday on a search warrant. A test by Dr. S.D. Jones revealed an alcohol content of about three per cent. Two hours later Kruse and Dunivan were arrested and the building closed. Fort Dodge police guarded the place during the night. Both were bound over to the grand jury next week for trial during the March term of Webster county district court if indicted. The state law provides a maximum penalty of $1,000 for conviction on the charge of illegal manufacture and sale of intoxicating liquor. There is no jail sentence. “We will prosecute the men in addition to whatever federal prohibition authorities may do,” County Attorney Gabrielson said. “We have and continue to stand ready to cooperate with federal authorities in every case of this kind. On the part of the government authorities the case is equally clear, Mr. Martin said. Both waived preliminary examination on advice of their attorney, J.R. Files, and were released on bonds to appear before the federal grand jury in United States district court, which convenes in Fort Dodge June 8. In removing the liquor and brewing apparatus from the building federal authorities encountered a snag in the prohibition enforcement law, which fails to provide funds for such removal and storage until after the trial of the men when the liquor can be destroyed. Assistant United States Attorney Seth Thomas wired authorities in Washington for a ruling. Sheriff Bassett was ready with a search warrant and declared he was ready to remove the liquor if federal authorities were not able to do so. The raid is the “largest” ever made in Fort Dodge, authorities said. suspicion that beer containing more than 1 1/2 per cent alcohol was being sold, centered about the place since last summer. It is believed that the scope of the business was gradually increased until it reached the dimensions of a small brewery, passing under the name of a soft drink parlor. A dozen witnesses have been obtained to testify that the brew had a “kick.” No definite information was received until the beer was tested late yesterday. The brewing apparatus resembled in all respects a small brewery authorities said. More than 200 pint bottles of beer were kept on ice under the bar. In a room to the rear 600 more bottles were stored in shelves covered in the front with cheese cloth. Bottles of every size and description were used, several being labeled Washington Brewing company, Washington, D.C. Some of the metal caps were marked “Lemon Sour, artificially colored,” and were clamped on with a small patented capping machine. Others were old root beer, ginger ale, soft drink caps; some were plain. About 300 pounds of sugar in “Rolled white oats” sacks. Five barrels of brew in the making. Fifteen cases (350 15 ounce packages) raisins. One barrel and four packages of hops. Four dozen large packages of a Cedar Rapids brand of yeast. Two hundred bottles of beer aging on the shelves, the supply of pint bottles evidently having run out. A small still, used to start the fermentation process in the mash before pouring it into the barrels and adding water. Authorities found numerous evidences that a prosperous business was built up. Along side of the cash register back of the bar were five water glasses filled with pennies, the proceeds from a day’s war taxes. Mr. Dunivan when asked to deposit bail, displayed a $2,000 certificate of deposit made at intervals during the last month with a Fort Dodge bank. Customers began arriving early today while federal, county and city authorities were examining the place by daylight, snapping pictures and taking inventory. A man breezed in as if the place was his familiar hangout, but detected something wrong and loitered near the door. A minute later a former service man, wearing an army overcoat and hat, stepped up to the bar. “I’m afraid we can’t accommodate you today,” a federal agent said to him. Five minutes later a baker rushed through the door with the customary morning supply of hot buns piled high on a big tray. “Sorry, old man, we can’t use those today. There’ll be no hot lunch served here today, it’ll all be over in the jail,” the federal agent said. The lunch counter testified to the abrupt departure of the proprietors. A pot of wienies, cold and unappetizing was standing on the shaky gas burner behind the bar. A dozen rolls, some cut open ready to be made into “hot dogs,” and a dried out half jar of mustard decorated the lunch board. On the shelf in front of the bar mirror were a dozen bottles of home made wine, partially empty, with an odor resembling vinegar. A gallon bottle of “wine” had turned to pure vinegar. An “alcohol tester,” which Kruse alleged was used to test the per cent alcohol in the brew to see that it contained mo more than one-half of one percent, was found in a neat box under the bar. Authorities said it was nothing more than a specific gravity tube, worthless for making an alcohol contest test.